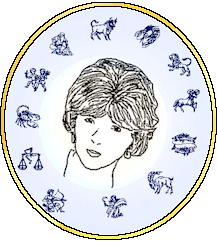 Home Horoscopes TV Shows Popular Services C.C.C. Begin a diet after the Full Moon on April 19h. One's potential, discovering oneself and inspiring others are important for this month. Jupiter turns Retrograde on the 10th and you may be drawn to such topics as philosophy, metaphysics and foreign cultures. Following the Full Moon on the 19th, there may be subtle changes in your one-to-one relationships as your gain a better understanding of others and yourself. Constructive powers, spiritual rebirth and hidden emotions are examined for this month. Jupiter goes Retrograde on the 10th and this may be a time of healing and positive change as will be easier to eliminate negative patterns. After the Full Moon on the 19th, you want efficiency in both your work through new skills and health through exercise and diet. Forming friendships, achieving your goal and group activities are the focus for this month. Jupiter turns Retrograde on the 10th making you want to meet new people to increase your social involvement and friendships. Following the Full Moon on the 19th, you will enjoy helping or working with your loved ones and children with their creative projects and hobbies. Setting priorities, personal power and career interests are explored for this month. Jupiter goes Retrograde on the 10th and you seek ways to improve your work through expanding the knowledge in your field. After the Full Moon on the 19th, it is a family time and you will be able to satisfactorily resolve any existing matters to everyone's satisfaction. Universal mysteries, seeking knowledge and philosophy on life are analyzed for this month. Jupiter turns Retrograde on the 10th and you want to enjoy yourself and have fun helping loved ones with their creative hobbies. Following the Full Moon on the 19th, there may be changes in the way you communicate with others and begin a new mental pursuit. Another's assets, spiritual appreciation and solving problems are highlighted for this month. Jupiter goes Retrograde on the 10th and you look for ways to improve your family relationships and to make your home more comfortable. After the Full Moon on the 19th, you may begin a new savings plan after you examine your current finances and spending habits. Professional help, forming relationships and a cooperative approach are perused for this month. Jupiter turns Retrograde on the 10th and you may reconsider a workshop or a formal class that you have wanted to attend. Following the Full Moon on the 19th, you want to express yourself in a diferent way as well as update your current appearance and self-image. Maintaining a diet, serving others and learning efficiency are important for this month. Jupiter goes Retrograde on the 10th and is a time when you should not be careless in financial matters or with your possessions. After the Full Moon on the 19th, you seek spiritual attunement as you have the ability to correct past mistakes and begin to move forward. Creative expression, innate affections and joys of life are favored for this month. Jupiter turns Retrograde on the 10th	and this can be the time to show more of your positive qualities and your desires for the future. Following the Full Moon on the 19th, you examine your recent achievements in life and begin to set new goals and long-term directions. Home-front activity, domestic interests and searching for self are examined for this month. Jupiter goes Retrograde on the 10th and solitude can be beneficial for healing on an inner, spiritual or psychological level. After the Full Moon on the 19th, you will review your career or the equivalent to determine if you want to change your aims in life. Daily activities, educational pursuits and all communications are important for this month. Jupiter turns Retrograde on the 10th	and you want to expand your community or neighborhood involvement through group activities. Following the Full Moon on the 19th, you begin to pursue your interest in the law, philosophy of life and your spiritual beliefs. Expanding resources, sense of values and material rewards are examined for this month. Jupiter goes Retrograde on the 10th and you may change your aims in life or receive long overdue recognition for a well-done project. After the Full Moon on the 19th, there are changes in jointly held money or property as you begin to settle old commitments.